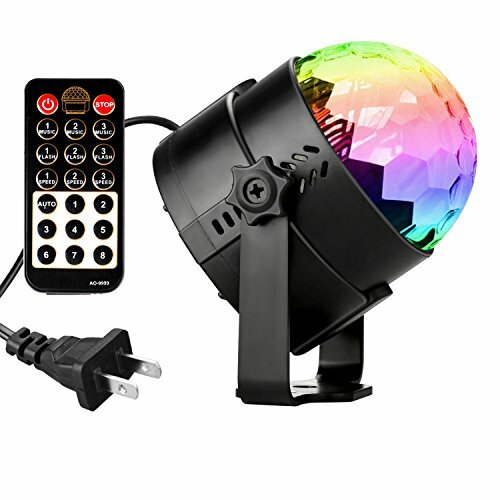 DeepDream Disco Ball Party Light 5W RGB LED Voice Control DJ Karaoke Stage Lights Kids Birthday Gift Home Party Supplies by Deep Dream at Elect Forum. MPN: DB-YEH3. Hurry! Limited time offer. Offer valid only while supplies last. 1. Wide Application: Perfect to kids birthday party, Pool party, Disco dance, Wedding, Christmas, Karaoke, DJ, Bar, Room, also can be night light or mood light. 2. Multi-Colored: 5W High Power, this LED can produce different light colors. The spherical surface is more than 80 which can give off more than 240 light rays, and provide a perfect atmosphere for your party. 3. Three Controls: remote, voice and automatic control, you can also adjust the light mode as you like, it can achieve a good dynamic fantasy effect, such as gradual change, jump and so on. 4. High quality assurance: safe and reliable, about 30,000 hours good stability. In addition, we can provide you with 12 months after-sale service. 5. Excellent design: Small and exquisite appearance, easy and simple to handle. If you have any questions about this product by Deep Dream, contact us by completing and submitting the form below. If you are looking for a specif part number, please include it with your message.